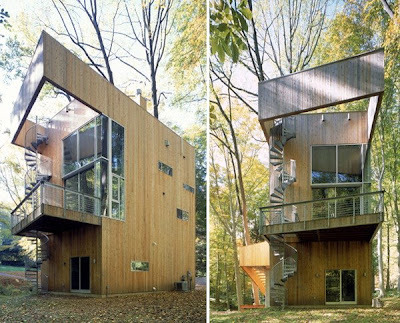 Tree House designed by Sander Architects, located in Wilmington, Delaware. From the heart to a quiet forest in Wilmington, Delaware, this contemporary tree house was admittedly a labor of love for architect Whitney Sander of Sander Architects. With a rushing stream at its feet, Tree House features a spectacular spiral staircase, running up the front of the home, past the modern Juliet-inspired balcony, & the expanse of glass that forms the front facade. The home’s very vertical construction places the master bedroom & living at the top, among the trees, with a rooftop deck as the most luxurious crowning touch.